The Minister for European Affairs said the government would be holding them to their commitment if necessary. MINISTER FOR EUROPEAN AFFAIRS Paschal Donohoe said that it has always been clear that the Irish government want the potential use of retrospective recapitalisation to be an option in the future. Speaking on RTE Radio One’s This Week, he said that in the meeting before the summer it was stated that the ESM fund could “be used on a case by case basis, that is in writing and this government will be holding people to that commitment if necessary”. He added: “We want it to be an option in the future if our banking system needs it”. 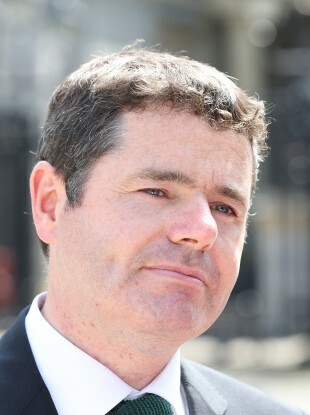 Donohoe said “the potential use of this fund retrospectively is acknowledged in writing by EU finance ministers …. and in any such negotiations, we are very well placed, because of the sacrifices Irish have already have made”. He said that due to the huge sacrifices that the Irish people have made Ireland is well placed to exit the bailout programme by the end of this year. He added that the Minister of Finance Michael Noonan has been in intensive talks with the Troika partners in Washington and the ECB last week. “I have always said the sustainability of our debt needs to be dealt with, that is why we were successful in tearing up the Anglo Irish Promissory notes,” he said. Email “Paschal Donohoe: 'The ESM retrospective use is acknowledged in writing by EU ministers'”. Feedback on “Paschal Donohoe: 'The ESM retrospective use is acknowledged in writing by EU ministers'”.